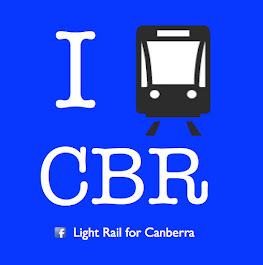 ACT Light Rail: It costs 870 million for 12 kilometers of Light Rail ? Apparently it s so expensive to build public transport infrastructure in Canberra, that 12 kilometers of light rail, from Civic to Gungahlin, would cost 870 million dollars. That is twice the cost of building the proposed Majura Parkway - a six lane freeway quality road that does not exist yet. How has the ACT Govt arrived at this figure? Thanks to a journo advising me of the Ministers Press Conference this afternoon, I managed to attend and listen to it in entirety. I had already read the press release – which did not contain the reports figures in it. As a general rule, The ACTGOV like to issue a press release ahead of the actual report, so that journos dont have time to read it. This avoids the possibility of any informed questioning. I raised this with a Transport for Canberra employee at the launch, who told me the report and figures would go live after the press conference. Great. Plus one for ‘open government’. When Minister Corbell announced that BRT would cost 300 million and Light Rail would cost 870 million I was just stunned. How on earth could he arrive at these figures ? How can a two lane light rail system travelling 12 kilometres cost more than twice the cost of the Majura Parkway ? I wish the journos had asked him. Post press conference I talked to journos and expressed ACT Light Rails disappointment. Based on Minister Corbells comments today, it is clear that the ALP are going to implement BRT. This being the case – why didnt they just say so a year ago, and spend that intervening year doing it. I’m sure the commuters of Gungahlin would appreciate that. Instead we delay any decision until – oh wow – an election year! I then went back to my office and discovered the reports were now online. I downloaded and digested the reports that had been kept from the public and media until after the opportunity to ask Minister Corbell informed questions had passed. I recommend the Concept Study for close scrutiny. Light rail – 700 to 870 million. 700 is a pretty high figure. Much higher than previous estimates. But lets take out say 200 million for the worlds finest, cutting edge, light rail vehicles rolling along on unobtainium coated wheels. Would it REALLY cost 500 million to build a 12 kilometre line ? The cost per kilometer of building light rail in Canberra compared to other cities building light rail. Yes, thats correct. triple the cost of the Gold Coast. Perhaps the ACT Govts consultants URS might like to revisit their costings. Then we arrive at the sleight of hand accounting trick that has been used to inflate the cost of light rail: do not count any vehicle cost for BRT, and make 20 percent of the 870 million LR figure the cost of LR vehicles. This is disingenuous at best as there are only a limited number of 100 plus passenger capacity vehicle in ACTIONS fleet, and IF the BRT was to achieve the service levels of the report – significant numbers of 100 plus passenger buses would need to be procured. Apparently these buses are FREE. For the report to be credible, these figures need to be added to the 360 million cost of BRT. The rest of the report is quite the read. Turning the rego office in Dickson into a shopping mall/bus station. I hope someone got a bonus for that idea. No one has ever said light rail is a cheap option, but it is the best long term option. The concept report says that – on page 55. And if anyone thinks this ALP government can actually deliver Bus Rapid Transit for 300 million, I refer you to every significant project this government has tackled and ask if any have been delivered on budget or on time. Its an empty cupboard of achievement. interesting comments and web site. can you be sure that the road estimate has not been underestimated? i am always interested in infrastructure expenditure, so please keep up your work. Hate to rain on the parade but the LRT estimate is quite in range. It is true some LRTs have cost less others have cost more. However, operating costs per passenger for LRT once built, is generally lower than BRT because LRT is higher speed and capacity, so capital costs are only part of the story. Still BRT is quite a bit cheaper to build than LRT. Not to say that makes BRT best but it is an economic reality. Someone needs to stress the possibility of driverless trams. Not having to pay drivers would surely reduce the long term cost compared to busses. Looking forward to the artist's impression of two ugly bus lanes down the middle of Northbourne Ave - strange they have pictures of light rail instead. Mate calm down. Both require substantial digging up of the roadway. LRT track work and signals sure are going to cost more than for BRT. I really would think that with your lobbying efforts over the years, you would have have comprehensive data on Australian costs to design and build and light rail and roadways. You seems to always dispute whatever report written by different consultants. Surely they know more than you? "You seems to always dispute whatever report written by different consultants. Surely they know more than you?" "intergrated" is misspelt and the use of "who's" is both clumsy and ungrammatical in "Provides a high capacity linear public transport service, who’s route and destinations are evident ..."
Did no-one proof-read this document? Not even Minister Corbell's office? Clearly this document is a pre-election con-job. We want ACT Light Rail to provide real life costs. Having read the report I believe it is a puff piece written for consumption of the ACT public to say we are doing something whilst doing nothing at all in the background. 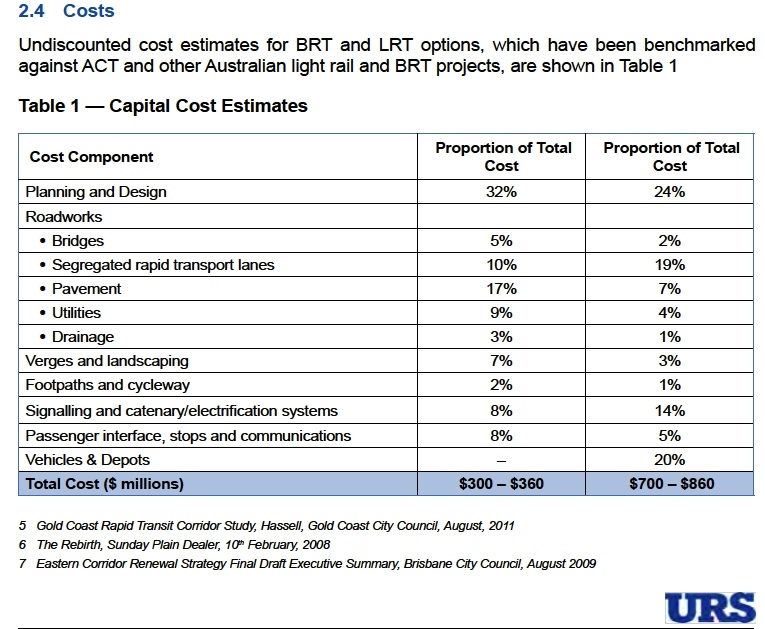 I have real questions about the costing as it only gives totals and percentages which for the BRT adds up to 101%. The table outlining the cost was also mislabelled. There is no actual cost break down per line item and per the 3 different sections. The description of Northbourne ave on page 6 is so odd and out of date that you wonder if the person who wrote this report has actually travelled along Northbourne. The plan to completely rebuild the current road bed on Northborne ave and move it into what is currently the median strip so the dedicated transport lane is on the outside of the road is downright crazy. Nowhere else in Australia does tram travel in the outside lane and the Griffth plan as described on page 5 has trams travelling down the median strip. This literally increase the cost by a factor of 4 by constructing 6 car lanes and 2 rail tracks compared to just constructing rail and a bike path in the median strip. This approach will create a traffic nightmare for years while construction is occurring. The reasoning on Page 20 fails to justify a very expensive re-construction project for 6km between Dickson and Civic. By using this justification StKilda Road in Melbourne by this same justification should be rebuilt on the same model. Unfortunately it’s the level of report that I have come to expect from the ACT government. 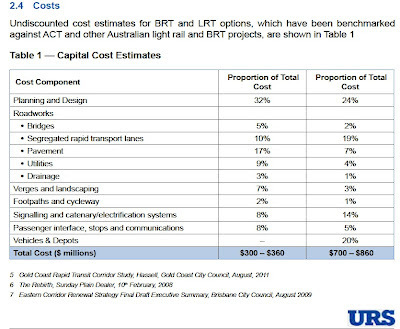 Is asking for a realistic BRT or LRT engineering itemised project cost seems too much to ask from the ACT local council. The report clearly also shows an option of the trams going down the median strip. Don't see what your point is. The bike lane on the footpath area is the most safer and logical option too. having the bike path on the median strip makes no sense. Who do they email them to ? [email protected] ? Perhaps it would be better if the labor government provided REALISTIC costings in the first place. Anyone know how much the Bombardier Flexity 2 (configured for 220 passengers) cost? These are the suggested LRT vehicles in the URS report. All the arguments about the cost of building a light rail system are of little value . Sufficient to say it would be huge and bound to exceed any estimate on which a decision to start was based. I am more concerned with the finished result. Canberra was designed and has been built so far for motor vehicles. The roads form the design of the city. A double track light rail would have to be superimposed on the existing road system as there is no place for a dedicated pathway. Be it it a tram or train, it has to negotiate all of the intersections and obey all of the traffic lights on route. None of the pretty pictures I have seen show the mess of overhead cables necessary to supply power to the line. It could notgove a faster or more frequent service throughout the day than the express inter-city busses. It cannot replace the intricate suburban bus network. Access Economics considers it would not be viable. I feel sure it wouild not be as rail systems require a huge volume of passenger traffic to be cost effective. A more worthy project in my view would be to take both lanes of Northbourne Avenue under City Hill. This would free up the space taken by Vernon circle, reduce vehicle distances, fuel usage and greenhouse gas emissions. I think it would be cheaper to dig a trench, and lay the train lines in big concrete pipes, sort of like they did in Kyoto. If you do that then there are no traffic congestion problems either, since the trains go under everything else, a much better result all round! Ok as an expert on Trams and tramways I'm going to throw my Bondi Tram line in here as well. As much as I would get off seeing trams running in Canberra it simply will never happen using the concepts being foisted on us by today's technology. There are not enough of us to support light rail, why can't we have trams? I mean real trams that do not cost these totally unrealistic figures per kilometre to build. Lets go back to REAL trams that cost around 1 million/kilometre to lay the track, why do we need signals unless its going to be single track and why in gods name do we have to copy what is going on overseas I say remembering the fiasco re the Belconnen Bus interchange that was copied form a location where the buses drove on the rhs of the road. Everyone should visit the Sydney Tramway Museum, Brisbane tramway Museum or the Adelaide tramway museum to see how it can be done low tech and LOW COST..... Come on get real if it had cost me that much to build the Lanyon Valley Steam & Electric Tramway it would never have happened..